…but not without some coaxing! Picture the scene: A slightly sunburned, blonde Brit crouched in the back of a pick-up truck (or a bakkie if you come from round here) holding both a DSLR with a weighty lens and a Canon PowerShot with a hefty zoom in one hand, and a rope in the other hand. You know those 20m or so plastic type ropes? Well one of those – green and white if you are wondering – that has been looped through a cut in the hind-leg of an impala carcass. Now, I can almost hear you wondering how on earth I (or indeed anyone) had found myself in this situation. 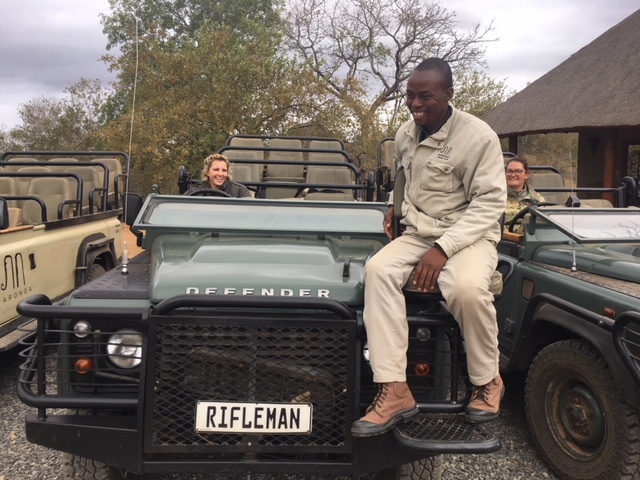 The answer, of course, is that together with the team, I was trying to tempt a female cheetah we were set to release whilst also hoping to document this exciting moment! The outcome was not exactly what we had hoped for. Things started out well. We had got the attention of the female cheetah, Patsy to her friends, and I had managed to catch a few shots of her as she started to follow us around the enclosure. Sure, we hit a couple of bumps along the road when the impala carcass got stuck on all the citrus trees in the enclosure (and there are a lot of them). But all round we felt positive about how things were progressing. 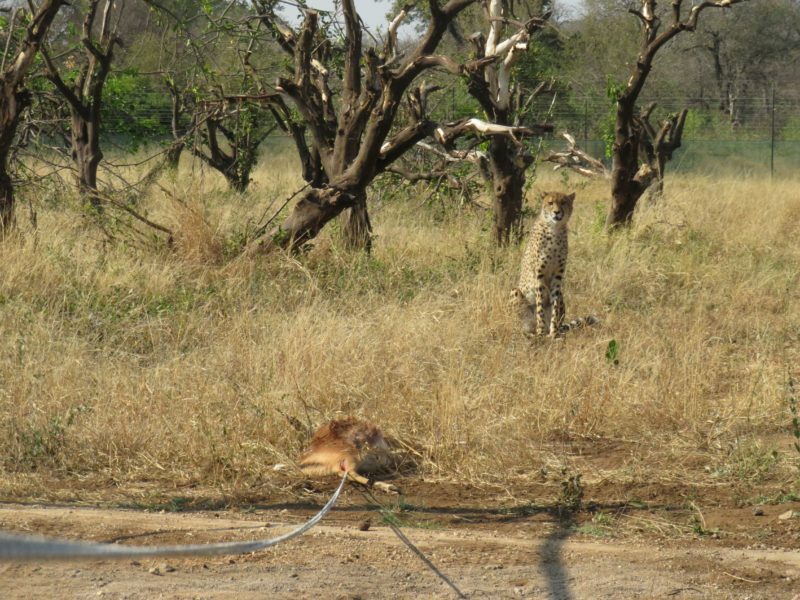 At one point, Patsy even picked up the impala in her mouth but on discovering she couldn’t simply drag it away she became an increasingly suspicious cheetah. Undeterred, we inched ever closer to the open gate and to Patsy’s freedom. For the fastest mammal on the planet, Patsy followed us agonizingly slowly, stopping to rest in the shade of her favourite orange trees and continuously assessing our intentions. We passed her inspections, barely, and finally we (and our sad impala comrade) were through the gate! We deposited our hairy friend about 7m from the gate and snuck off into the distance to watch Patsy take the bait. Or, as it happened, to watch Patsy lie in the shade about half a metre from the gate and show no inclination whatsoever to go through it. I can’t say I blame her. This whole drama had taken about an hour and a half and, at this stage, was punishingly hot. This was on top of the Garonga Pride paying the cheetah boma an early morning visit, during which time they circled the boma and tested her eardrums with some intense roaring. In the end we gave up with our cheetah release. Patsy lived for another week in the boma with the impala carcass to devour for her troubles, whilst we slinked away to attempt the release on another day. I suspect at this point you are all bursting with questions. Why don’t we just open the gate and let Patsy wander to freedom in her own time? And why was Patsy in the enclosure in the first place? To answer the first question, when wild animals have been in enclosures for a while they get used to the ‘room service’. So, when released they tend to spend their first week waiting for their next meal to be brought to them. That’s why it’s important to ensure they have had a decent feed, hence the alluring impala carcass. We had an extra factor at play here at Garonga as our pride of lions had taken an unhealthy interest in our cheetah friend. We were concerned that if we opened the gate to let Patsy wonder out in her own time, we would run the risk of the lions finding her before she had mustered up the courage to venture through the gate. As for why Patsy was in the enclosure in the first place, that is a sad tale and it relates to the fate of cheetahs in the wild. There are currently approximately only 6,700 cheetahs in the wild across the world and they are listed as Endangered with Extinction on the IUCN Red List of Threatened Species. 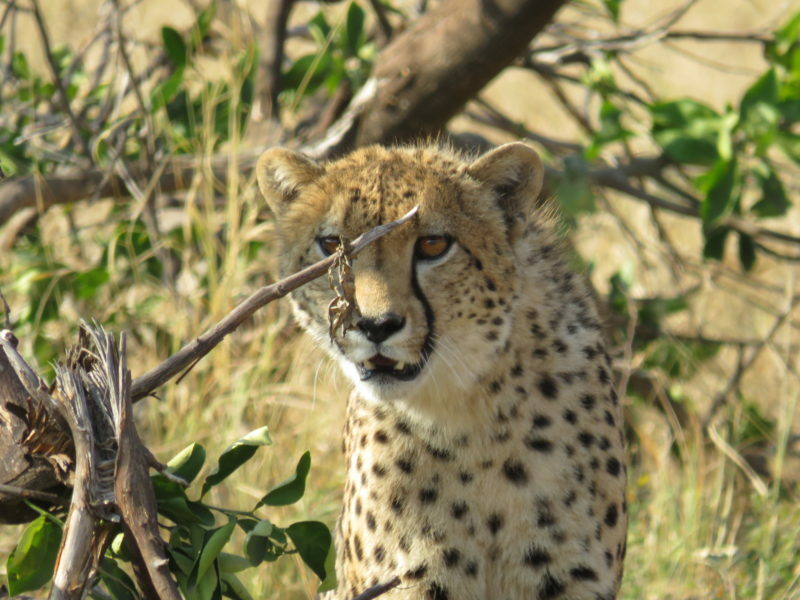 Best estimates are that cheetahs have disappeared from about 76% of their historic range on the African continent. One of the major causes of this decline is habitat loss. 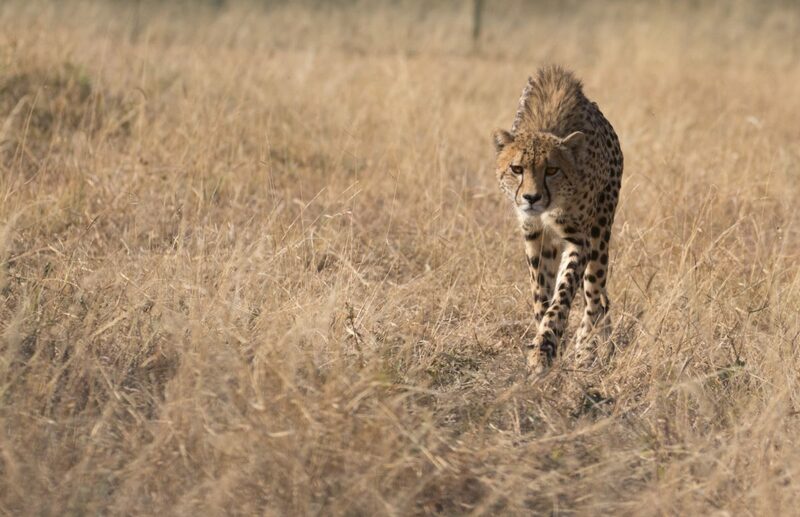 Cheetahs are best adapted to have enormous territories but as the human population continues to expand, there is decreasing space available to cheetahs and, left to their own devices, they are adapting slowly to this change. 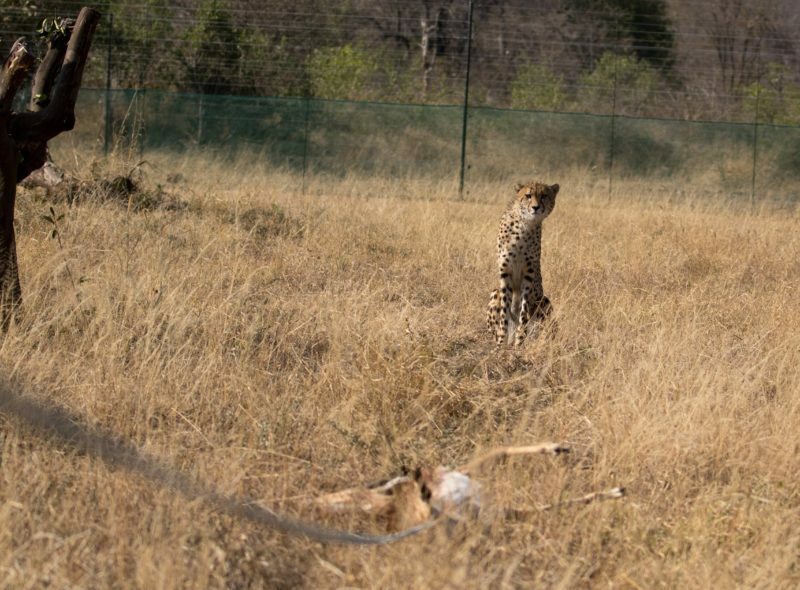 At Garonga, in the Greater Makalali Private Nature Reserve, our cheetahs have adapted to a different style of hunting. They still use their amazing speed but now in conjunction with the human-made fences, which they use to chase prey as if the fence is an extra hunting partner. Patsy will be our second adult female in the reserve. Having come from a different part of South Africa, she brings the gift not only of her femininity but also a rejuvenation of the cheetah gene pool for the reserve. 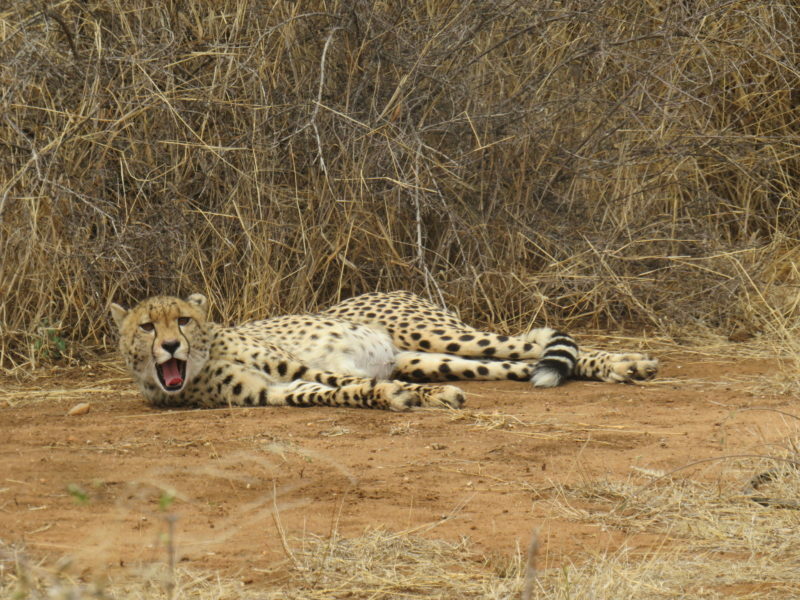 As our wild spaces continue to dwindle, we see four major challenges facing our cheetahs, namely habitat loss, lack of genetic diversity, human and animal conflict, and competition with other predators. By introducing Patsy into the Greater Makalali Private Nature Reserve we are hoping to do what we can to help in the conservation of this stunning species. Now, coming back to Patsy’s release! Working with nature is often bizarrely like working as a comedian because it’s so often about the timing. About a week after the shenanigans described above, we dragged a second impala carcass behind a vehicle and this time Patsy was after it like a shot. This time the whole process took just five minutes! Patsy is now freely roaming the reserve and we sincerely hope that she thrives here – keep an eye on Garonga’s social media feeds for updates on her progress! Written by Sophie Barrett (Guide, Tracker, Photographer and Videographer at Garonga. Book with us and enjoy wild South Africa. 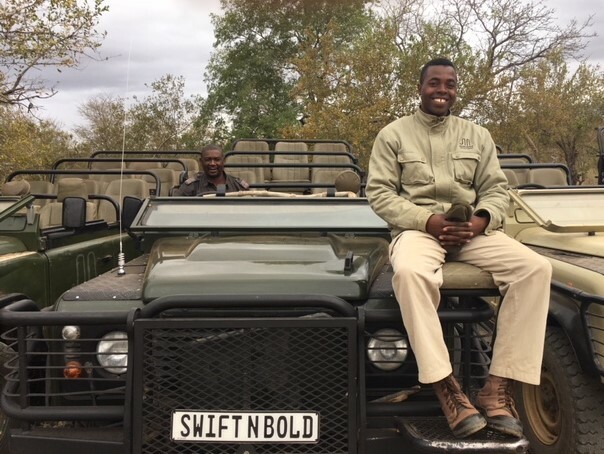 Meet the safari guide team who hold the dreams of our guests in their hands, when they set out in search of the perfect safari experience. 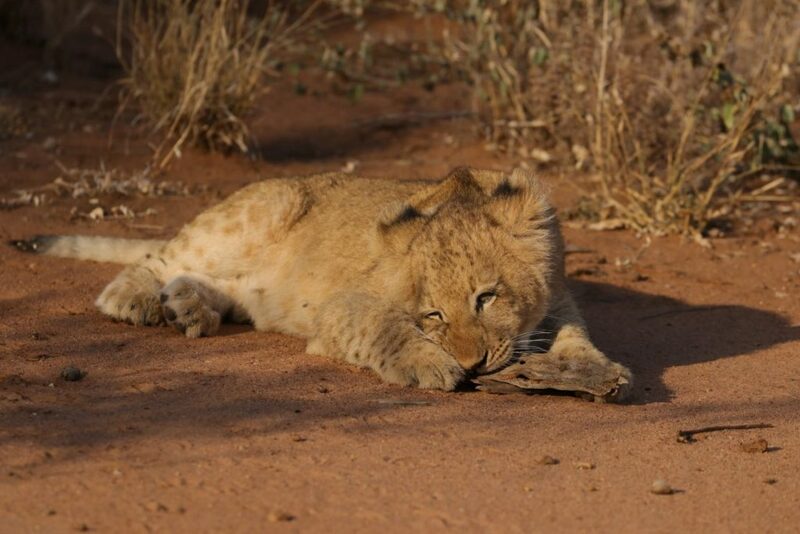 There is nothing quite like the excitement and anticipation of your first game drive. The wind in your hair and the scent of the bush whizzing past as you set off. This experience is what draws our guests to book at Garonga Safari Camp. 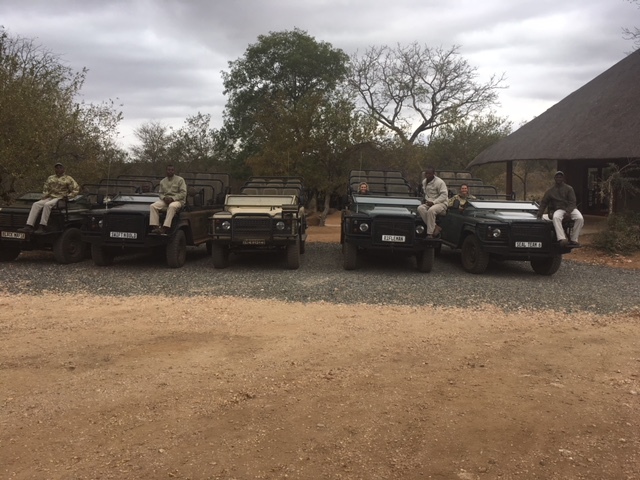 Operating on 22,000HA private game reserve in the Makalali Conservancy just west of Kruger National Park, we have all the big game and heaps more. 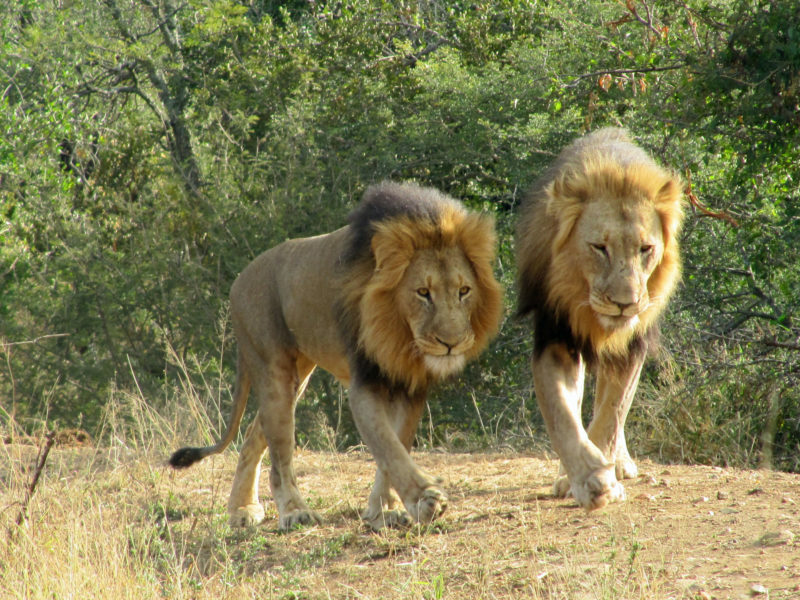 Being situated in a large wilderness area also contributes towards such an amazing game viewing area. With passion driving them, all members of our safari guide team are here to give you maximum game viewing experience. As Head Guide at Garonga, Jaff started here as a tracker when we first opened 21 years ago. Over time he has passed various qualifications and progressed through a position of guide to now our Head Guide. His key strength is his tracking skill. Currently he is trying to accomplish his Senior Tracker Level which is one step below the highest tracking level achievable. When Jaff is on leave, Josia picks up position as 2nd in charge. He also has a “Walk Experience” to share with the guests – ‘The Solitude Walk’. Not always easy keeping people silent throughout a walk. He is a very accomplished safari guide and brings in great humour and fun to his safaris. Samantha is currently attempting her Trails Guide, which will then enable her to also carry out walks, or to substitute if Josia is away. She is an extremely keen and enthusiastic guide, and very willing to go the extra mile to find the game for her guests. One of the ‘old school’ who has been guiding for over 20 years. Derrick is a very accomplished and experienced guide. Although only just started with Garonga Safari Camp, he has fitted in very well with the ‘Safari for the Soul’ philosophy. We aim to up-skill him even more to enable him to lead more diverse safaris. Although having just joined us via the Bushwise Training Programme, Sophie has been guiding for over two years. She has traded her legal career in the UK for her passion – guiding in the African bush. She can communicate confidently in French, and can get away with passable Spanish, which is extremely handy for our European guests. Sophie is very passionate and enthusiastic about her new-found career. Sophie is also an excellent photographer and has the added responsibility of sending video and image content as well as written copy for use on our website and social platforms. Kaizer teams up with Sophie and is very knowledgeable and has that 6th sense as to where the animals are heading. A very capable tracker indeed and converses well with our guests. He has just passed his FGASA 1 Level Guides Exam theory and practical, so he is also a qualified guide. He teams up with Josia and always carries a great smile and sense of humour. Phineas is a very capable tracker and works extremely well with Josia, making them quite an amusing team. He also has just passed his FGASA 1 Level Guides Exam. Richard has been here the longest amongst the trackers and he teams up well with Jaff. A very thorough and experienced tracker. You may also come across Richard behind the Manhattan Bar in the Boma, serving after dinner drinks. Richard has also just passed his FGASA 1 Level Guide Exam. He tracks with Samantha, and is a very likeable, well-spoken and intelligent person. Steward is fairly new to tracking but has taken to it extremely well. He received top marks out of all the trackers for the FGASA 1 Level Guides Exam and so holds great potential. Bongi is a very enthusiastic tracker and teams up with Derrick. Being very new to the team, our aim is to get him fully qualified up to a FGASA 1 Level Guide over the next 3 months. We foresee him being a great asset to the safari team. This is a big team with a big heart. Their responsibility is a great one as guests arrive full of hope and expectation to see as much wildlife as possible. Time and time again the team continue to deliver using their experience, knowledge and passion. Thank you to all at Garonga Safari Camp for your hard work, energy and commitment to your roles! On the 7th of July 2018 we came across a very sad sight on our morning game drive at Garonga Safari Camp. We found the bodies of two young lion cubs who had been killed…and so began our murder mystery. 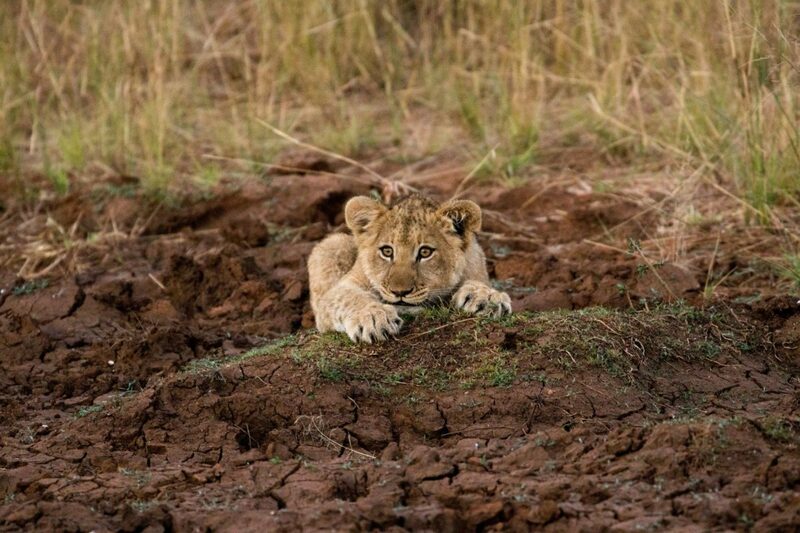 Unfortunately, life for a young lion cub is a tough one as almost every predator will kill them if they have the chance as it is all part of their instinct to remove competition and prevent the cubs becoming a threat when they are older. Whilst the pool of potential suspects was large, our investigative team was leaning towards an adult male lion as the culprit for the crime. 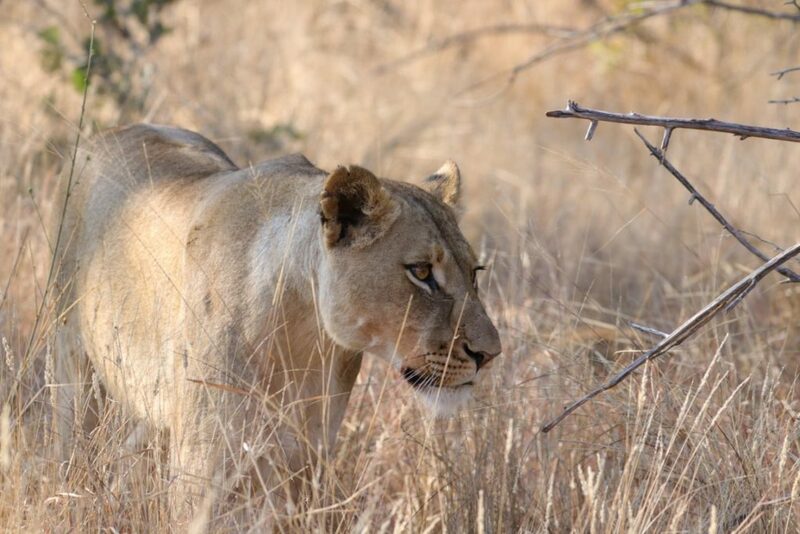 The previous evening we had received reports of a pair of mating lions in almost the exact same spot. It is always heart breaking to see any of the animals lose their lives, but the Garonga team was especially concerned that the dead cubs might be the two adorable trouble makers from ‘the Garonga pride’. For those of you who haven’t had the pleasure of meeting them, ‘the Garonga pride’ it is made up of three feisty females; granny, mum and a perpetually curious daughter, two resident pride males and two heartwrenchingly mischievous cubs. For about 3 days our lions went into full stealth mode, and despite finding fresh tracks, they had retreated deep into the thickets and we saw neither hide nor hair of them. Now, as guides, strictly speaking you are not supposed to have favourite animals. However, the Garonga pride has managed to sneak its way into the hearts of our whole team and we were increasingly desperate to discover the fate of our cubs. One morning it was quiet in the lodge so we collected together our expert trackers and set out to unravel the mystery once and for all. 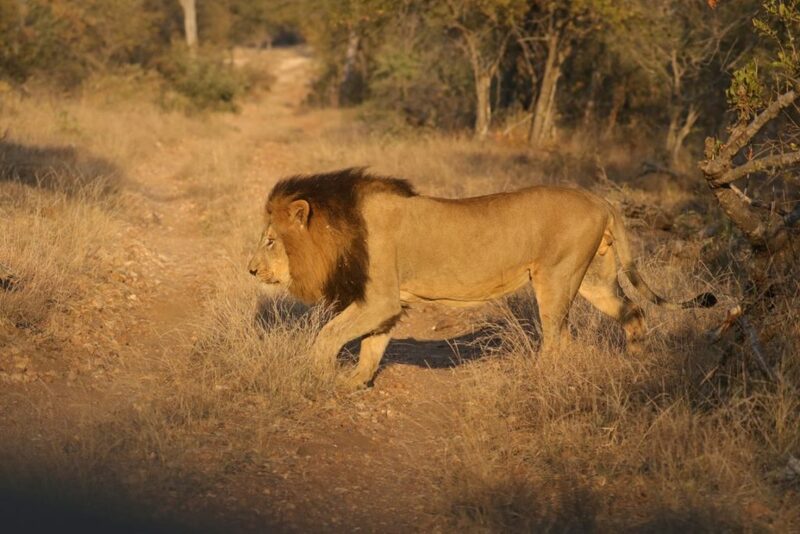 It seemed that the lions were missing us too as at about 5.30 that morning they had been calling. This gave us a heading and before too long we found our 3 females looking healthy and relaxed, but the cubs were nowhere to be seen. However, the cubs are still at an age where their mother will usually hide them in thick bush to keep them safe during the day. Not to be defeated we left the ladies and picked up their tracks, tracking in reverse to look for evidence that our cubs were still with us. 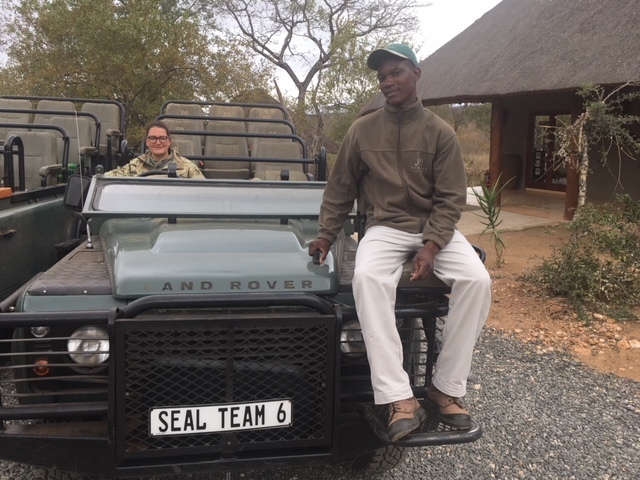 To cover the maximum ground possible we split the team with Josia, Samantha, Derrick, Stewart and Sophie on foot and Kaizer, Phineas and Bongi on the vehicle. After tracking the one female through drainage lines and across some of our more open plains we had the best discovery – miniature lion tracks sitting on top of the dew from the night before and heading towards a thicket that would be the perfect place to stash a pair of cubs for the day. We radioed in the rest of the team and had a celebratory coffee stop, delighted to have discovered that our little troublemakers were alive and well. Later we slowly started heading towards where the cubs had spent the day and were rewarded with two little furballs full of energy chasing after mum and pouncing on each other. The relief was shared by the whole safari camp team and was enormous. 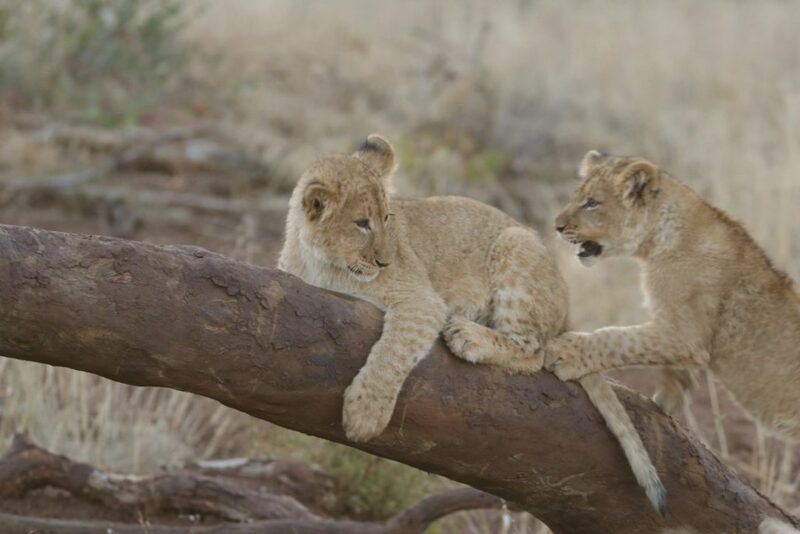 It seems that the two cubs who lost their lives were, in fact, from a rival pride that had wandered into the territory belonging to the Garonga males. It is always sad to see such a sight but a male lion’s instinct to kill cubs that are not his own is one of the harsh realities of the circle of life, it helps to ensure that the strongest genes are being passed to the next generation of lions, which in turn will hopefully help to ensure that we can continue to marvel at these incredible creatures for years to come. The life of a safari camp guide is never a dull one and this episode of Bush CSI [Crime Scene Investigation] is certainly not for the faint-hearted. From agile antelopes to impressive elephants there is always something intriguing to see in the thick Makalali bushveld. But it is predator sightings that tend to be the most rejoiced. ‘At first glance, there was nothing but bush. 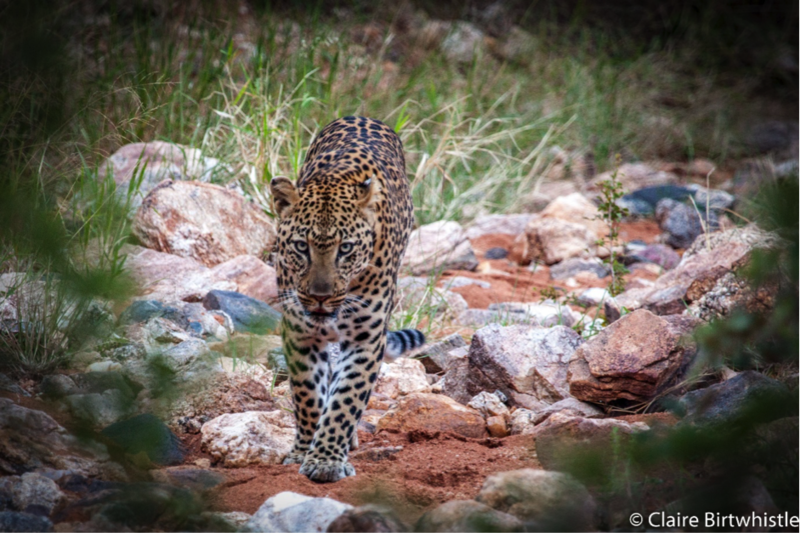 However, slowly but surely, the unmistakable rosettes of a leopard became visible and an enormous male leopard emerged from the thickets. I could barely contain my excitement, let alone focus my camera. As quickly as he had appeared, he was gone again. Like a unicorn of the bush, he left us wondering if we’d even seen him to begin with. After all, spotting a leopard in the wild seemed like a far-flung dream for me at the time. 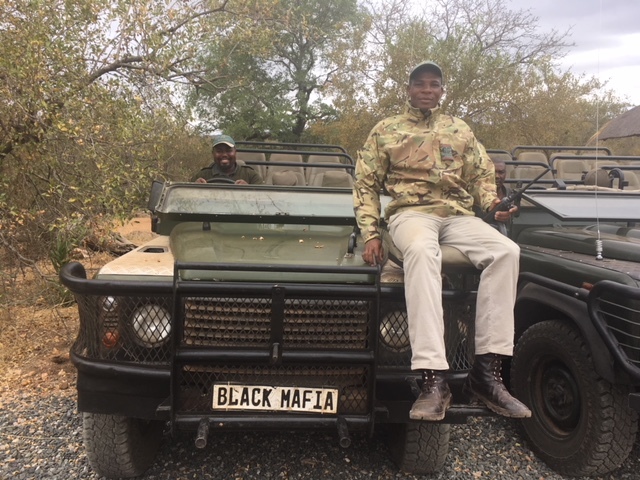 I was desperate to see one of course, but after several different wildlife safaris, countless game drives and still no leopard sighting, my hopes weren’t high. As soon as the leopard disappeared into the bush, our expert guide, CJ, and tracker, Phineas, sprang into action. Their familiarity with the bush was unbelievable as we bundu-bashed our way down to the dry river bed. Positioning us with a clear view of the river bed in front of us, CJ switched off the engine and we waited. 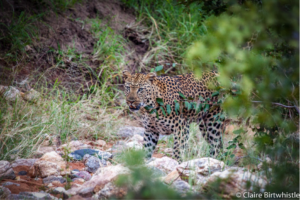 Sure enough, just a few minutes later, we detected some movement in the bush and the leopard revealed himself again. This time I was ready with my camera, and despite the low light conditions, managed to capture a couple of photographs of this magnificent creature.